Owing to the dedication of our diligent professionals, we have earned a reputed name in trading, exporting and supplying the finest quality assortment of Marble Mortar And Pestle. Features like remarkable quality and optimum durability, our offered product ahead of its competitors. LE PHOENIX ARTS BRINGS YOU EXOTIC KITCHEN WARE RANGE OF KHARAL OR MORTAR PISTLE SET IN VARIETY OF COLORED MARBLE viz. WHITE AMBAJI MARBLE, BLACK MARBLE, FOREST GREEN STONE...AND MANY MORE..
Well known for our excellence in manufacturing and exporting a wide variety of Marble Mortar and Pestle. 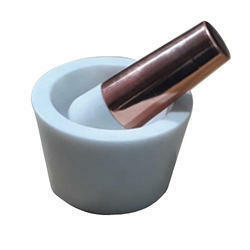 We are dedicatedly involved in providing a wide array of Marble Mortar and Pestle. Size: Size: 10cm L x 10cm W x 14cm H. Weight: 1100grms. 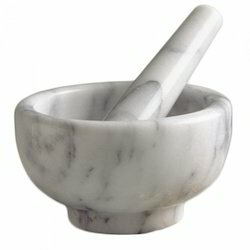 • Carved onyx marble spice mortar and pestle is made from premium quality marble.